Whether you’re just starting out in the interior design world or you’ve been here for longer than you can remember, there’s one thing we can all agree on: sometimes it’s good to go back to basics. 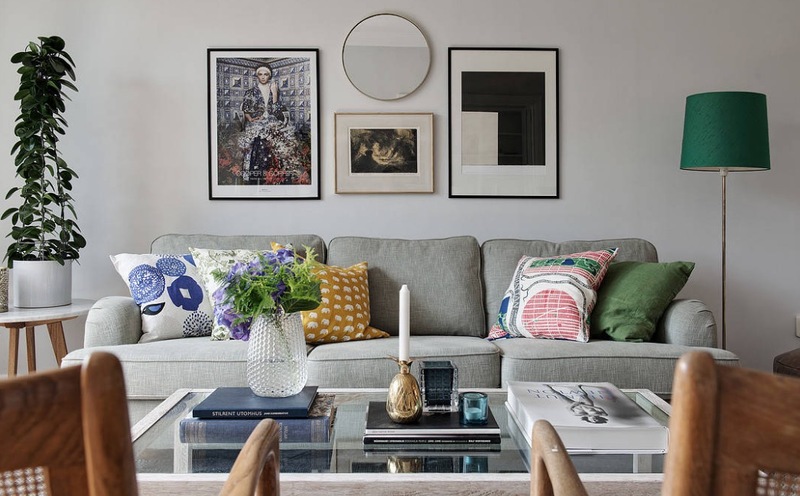 With that sentiment in mind, today we’ve brought you three interior design rules that will totally transform the way you tackle the rooms in your home. Before you scoff and say, “Aren’t rules made to be broken?” hear us out. These rules are gold standards for a reason. Read them over before you write them off once and for all. We’re sure if you give them a fair shot you’ll easily see what a difference they can make. The newest addition to the bunch, the 3/3 vertical rule comes to us courtesy of designer Mark McCauley, who outlined the concept in his book, Color Therapy at Home: Real-Life Solutions for Adding Color to Your Life. Like many other current trends, this rule builds on our persistent desire to assimilate the great outdoors with our interior aesthetics. McCauley’s concept works like this: if nature were a framed viewpoint, the darkest colors would be found towards the ground. (Think dark grasses, stones, and mud.) Meanwhile, the medium tones of trees and plant life would be in the middle. Lightly-toned skies would round out the top of the frame. In his view, an elegant interior design will work in much the same way, with the darkest shade on the bottom, a medium shade in the middle, and the lightest shade on top. This can be a helpful place to start for those trying to form a color palette. It can work with both colorful hues and monochromatic shades. Once you’ve decided which colors you’d like to use, it’s time to determine which role they’ll play in your design. That’s where the 10-30-60 rule comes in. With this rule, you’ll end up choosing a dominant shade, a secondary shade, and an accent color. As the name of this rule suggests, your dominant shade will cover about 60% of the room. Since it plays such a large role in your design, you may want this to be your most neutral choice. The dominant shade is a good choice for things like your wall color and floor coverings. Then, your secondary shade can be a bit bolder and is usually fit for furniture. Finally, your accent color is your boldest choice and can be found in accessories. Take the picture above as an example. Since the fresh, white color carries most of the room, that is clearly the dominant shade. Meanwhile, the mustard yellow found in the chairs and accent pillows is a solid choice for a secondary color. The blue accent wall is undoubtedly the boldest shade. After you have the colors under control, it’s time to look at your accessories. We’ve talked about the importance of purposefully styling surfaces and grouping accent pieces before, but if you take one tip away from this, it should be — when in doubt, follow the rule of three. Odd-numbered groupings create more visual interest than even numbered groupings. In particular, three seems to be the ideal number for a grouping as opposed to one, five, or even seven because the former might feel too simple while the latter two run the risk of appearing overly cluttered. When selecting items to go in your grouping, you want to ensure that they’re different enough to create visual interest while still having a common thread to tie them together. Take the picture above, for instance. While all the accessories have varying shapes, they have a unifying color. When you’re not sure where to start with a design, sometimes it can help to go all the way back to the fundamentals. With that in mind, we’ve brought you three interior design rules that can help you balance out just about any design. Regardless of which room your working on or your personal sense of style, you may want to consider giving these a try. It never hurts to go back to the basics.